Federal Regulations mandate 40 hours of instrument aeronautical experience (Flight Time) for the Instrument Rating. The National average is, honestly, 56 (+) hours to attain the skills to attain the rating. However, NOT at ChinookFlight! Our experience is 42 hours for my students to get that rating! How do we do that? We employ the REDBIRD Flight Simulator: The best simulator for General Aviation Use, BAR NONE! So good, the FAA Themselves use a full series of them to keep their personnel fully trained. This is no pretty box sitting in a small room on a table. The Redbird is a full motion trainer that allows us to stop, relocate, adapt to YOUR particular needs. No wasted time (and EXPENSE). 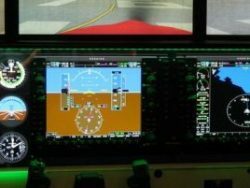 From the moment you are in the simulator every bit of time is devoted to skill development, not flying around waiting for ATC or other activities. Fully 20 hours is replaced with the Redbird, not 10 hours like others. And the value of training in the Redbird is so good, this is why we save you so much money. But also: When it comes to Instrument Training, dont you want your instructor to have Real World experience? We are professional instructors now! We have been professionally employed as pilots flying in the system for quite some time. We know what it is like out there, flying across the country in the system, in solid IMC, not in the sterile training environment. Our rate for instruction & stuff is a fixed rate! All Students become student members of Puget Sound Flyers Club!